1 of 4 Scatter half the onion slices in bottom of a 4- or 5-quart slow cooker. Season roast with 1 tsp of the rosemary, the salt, garlic powder and pepper. Add to slow cooker on top of onion. 2 of 4 Place carrots, potatoes and remaining onion slices around and on top of roast in slow cooker. Sprinkle with remaining 1 tsp rosemary. Whisk together broth and Worcestershire and pour over vegetables. Cover and slow cook on HIGH for 61/2 hours or on LOW for 8 hours. 3 of 4 With a slotted spoon, transfer vegetables to a serving platter. With a large spatula, lift out roast, trying to keep in one piece. Place on top of vegetables and strain liquid into a fat separator or measuring cup. Transfer remaining vegetables to platter. 4 of 4 Skim fat from liquid and transfer to a small saucepan. Combine flour and 3 tbsp water in a small bowl. Whisk into saucepan. Bring to a simmer over medium heat. 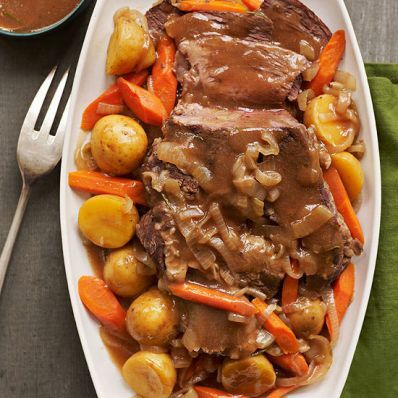 Cook 3 minutes and serve alongside pot roast and vegetables.